There is something restorative about watching the sunset on a beach with warm winds blowing, surrounded by family and friends. We took a trip to Southern California this weekend to get out of the cold. We always find our way back to this beach–Crescent Cove. This is the beach where my wife grew up. This is the beach where I asked her to marry me. Fortunately, she said yes. I think the waves and wind were in my favor that day. Now, we bring our kids to this beach. 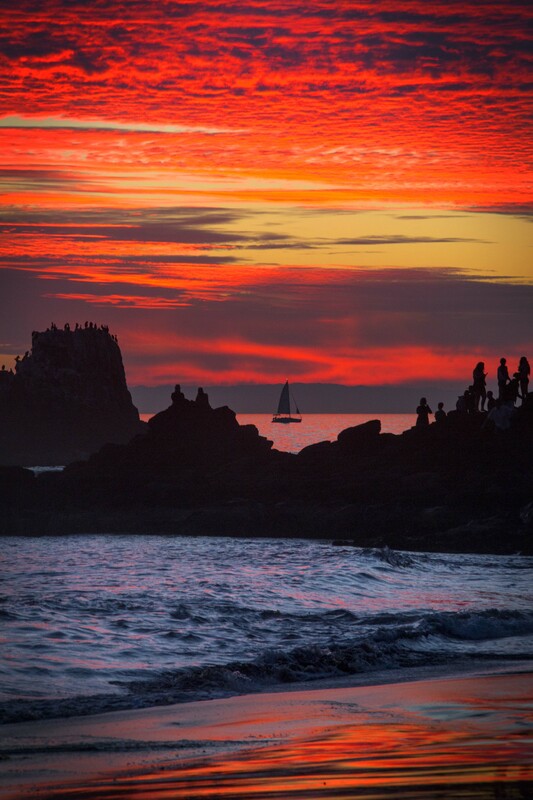 We climb on the rocks and play in the sand–and, we watch the sunset. There is a peace we find here that calls to us when we wander.Yet, the winds blow us back and we shall return on a distant tide. Sunset on the beach at Crescent Cove, California. See that sail boat . W.O.W. Our grand daughter really says it well : most beautiful picture!!! Most perfect timing!! Magazine worthy! Thank you for sharing!!! !